The automation of processes is a crucial practice for effectively supporting any type of business. New, innovative technologies are profoundly elevating business value, setting at the forefront the next generation in automation, that of intelligent process automation and machine learning. 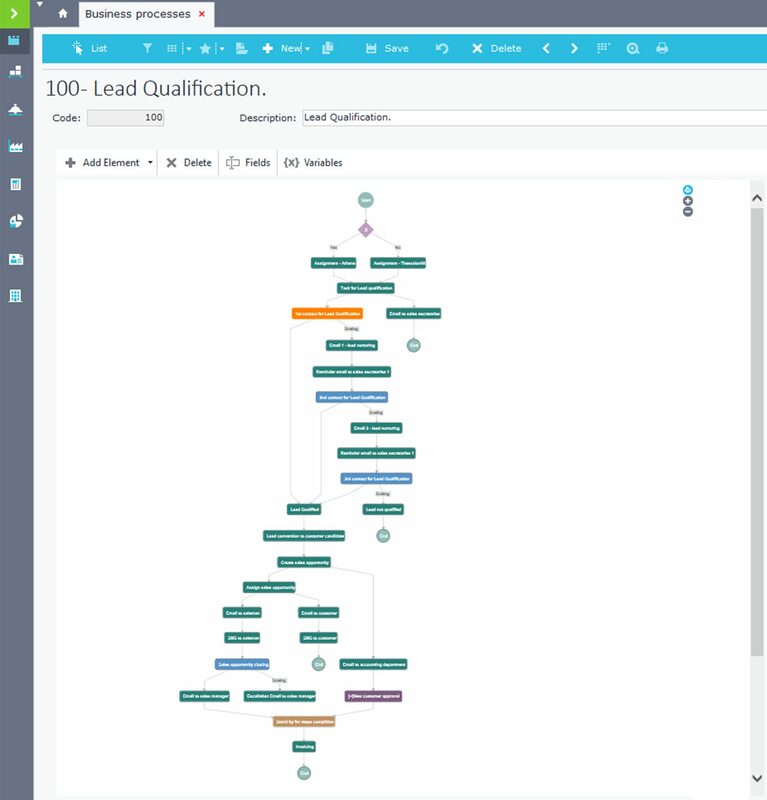 SoftOne proudly enters the exciting world of intelligent automation, artificial intelligent business support and machine learning with Soft1 B.A.M (Business Automation Machine) and EVA, the Soft1 Enterprise Virtual Assistant. The Soft1 B.A.M (Business Automation Machine) is a tool designed to define, coordinate and automate the execution of business processes. 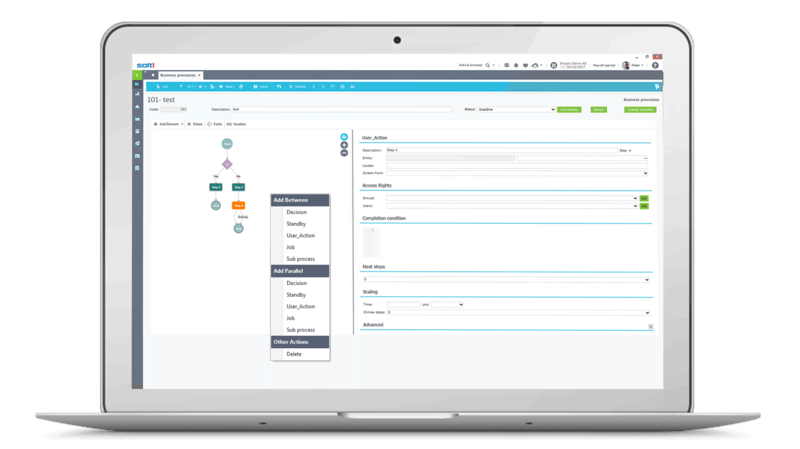 The Soft1 Business Automation Machine is available across the Soft1 platform. 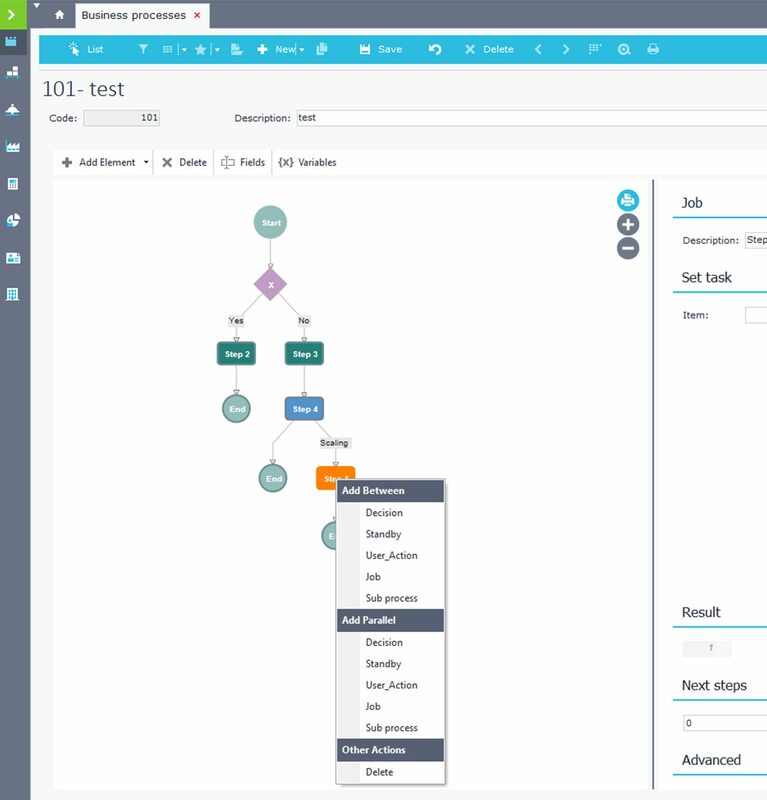 With Soft1 B.A.M you can automate a short series of actions or extensive, complex repetitive processes. Soft1 B.A.M transforms the way work gets done across people and departments, enabling power users to swiftly design and implement their own automated processes. Process automation is crucial in helping businesses run more efficiently. The more actions and processes an organization can systematize, the more time it will free up for its employees. The use of Soft1 Business Automation Machine eliminates tedious tasks from employees, allowing them to focus on more position related activities. Process automation ensures that all actions are performed identically, resulting in consistent results. SoftOne’s Business Automation Machine assists businesses to eliminate all manual and human errors that would else cost valuable time and resources to handle. Soft1 B.A.M will notify for late actions, ignored tasks and much more. Moreover, using Soft1 B.A.M will reduce the time needed to achieve a task, the effort required to undertake it and the cost of implementing it successfully. Soft1 Business Automation Machine allows managers to analyze comprehensive trend reports, realize serious bottlenecks and monitor performance in real-time. This enables managers to be more proactive, plan better, work more efficiently and make faster, more informed decisions, using insightful information. Soft1’s Business Automation Machine enables business users to seamlessly map, design and modify any kind of process model either parallel or sequential, from simple projects to enterprise-wide programs. Without needing special training or coding, simply by entering each step of the process with drag & drop functionality. Set the critical policies and conditions, deploy efficiently a business process and engage users within minutes. Grant access to participants and ensure access privileges are granted to each user depending on their role and the deployed business process. Soft1 Business Automation Machine naturally supports across the board integration with all Soft1 applications, including Soft1 Web & Mobile applications. It enables teams to work from anywhere, with any smart device, while process administrators hold full remote access to business operations and live processes. Manage and monitor any process, directly from the Soft1 application. Get real-time visibility into any stage of the process and identify inefficiencies that lead to bottlenecks and address them before they become issues. Get rid all the unnecessary steps, redesign and optimize your processes in no time. Keep track of changes and ensure that all recorded actions are safeguarded against new process versions. Easily check the progress of any process by viewing the status graphical diagram and examine user responses. Track all pending forms and actions and review the status of every pending item at any time. Keep all process participants informed, increasing the team's visibility and prompting timely responses. Soft1 Business Automation Machine enables process owners and managers to create dashboards and gadgets to dynamically measure performance with real-time analytics. Using Soft1 Business Automation Machine, process owners have full capability to measure key metrics, being able to make decisions with much more agility and assertiveness. EVA stands for Enterprise Virtual Assistant, an innovative agent that provides business automation capabilities on any smart device. EVA helps and guides users to automate, prioritize and complete their tasks in less time than they used to. 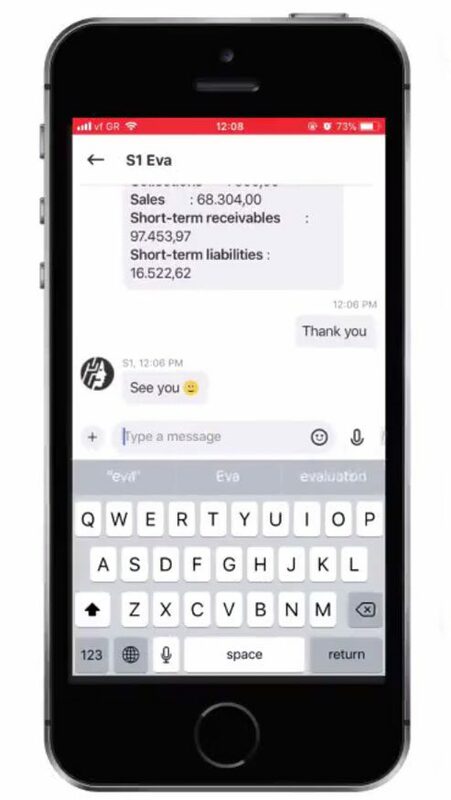 EVA provides Soft1 users with a truly remarkable and unique experience, as through EVA, they can communicate and interact with their business software in the exact same way they do with their colleagues: through conversation. For the first time, employees can utilize data and information of their ERP system without connecting with it. EVA is powered by a set of innovative technologies that include natural language processing, cognitive intelligent and conversational user interfaces. It also effusively exploits the capabilities of Soft1 Web Services and of Soft1 Cloud platform deployed on Microsoft Azure. EVA benefits from the most sophisticated engineering technologies available today. As a result, EVA is capable of natural language processing across multiple channels, fully understanding what a user is asking on any preferred language. EVA delivers an overall outstanding user experience, as it is the most natural, easy and fast way to get things done. 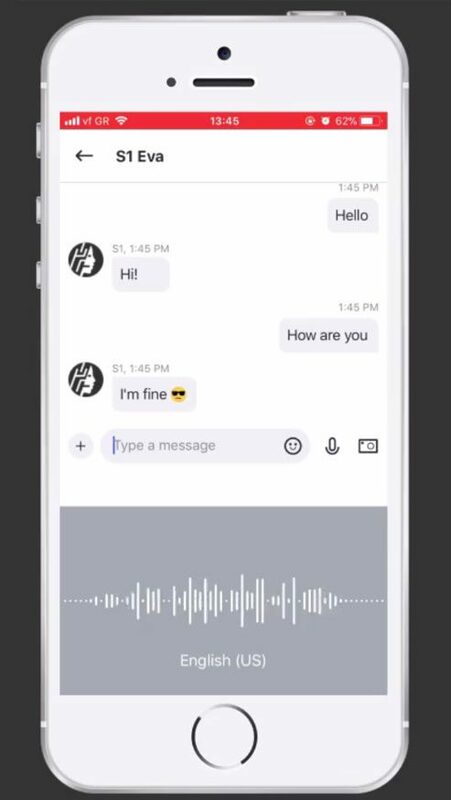 Using its conversational and cognitive capabilities, EVA is fully capable of effectively performing specific tasks and respond instantly to simple user queries using as a communication channel either Skype or Facebook Messenger. Through any smart device, EVA can instantly answer any question regarding financial and operational data, sales, orders, purchases, inventory status, manage approvals etc. It can also send and manage alerts, warnings and messages. All the user has to do is just ask EVA. EVA’s future is just bright. Incorporating even more innovative technologies in the future, EVA is set to reshape the operational model of modern businesses. Exploiting and implementing even further machine learning capabilities in future editions, EVA would be capable of processing and automating most business tasks and interactions performed by employees on a daily basis. Engaging users in the most natural way, EVA aspires to be the most preferable communication gateway with the business software in the near future.